I roll with the “made from scratch” club 99% of the time, but today’s life-changing skinny avocado brownies are a shortcut to brownie bliss. Crave-worthy at only a fraction of the calories. You’ll never look at brownies the same way again. 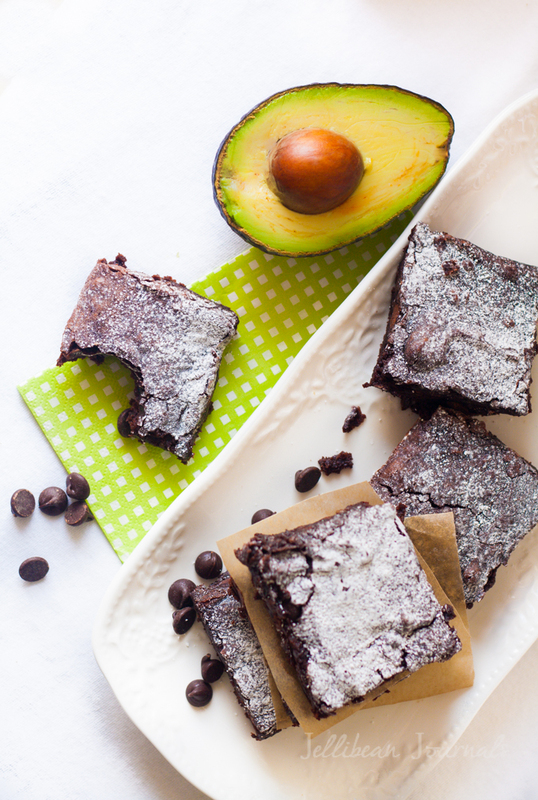 These are ultra-simple TWO ingredient avocado brownies… or should I say three? Nah, water doesn’t count. These brownies are rich, fudgy, delicious, and just so happen to be healthier than most brownies. All you’ll need is a box of brownie mix and a couple of ripe avocados. Sink your teeth into skinny avocado brownies, your pre-season tickets to poolside confidence. Prep a 9x9" square baking dish (for thick brownies) or a 9x13" dish by greasing it or lining with parchment paper. Stir together brownie mix, avocado, and water until combined. Bake as directed on the brownie mix package erring on the side of baking a minute or two more than normal. To cut picture perfect brownies, slice into cooled brownies with a plastic knife. 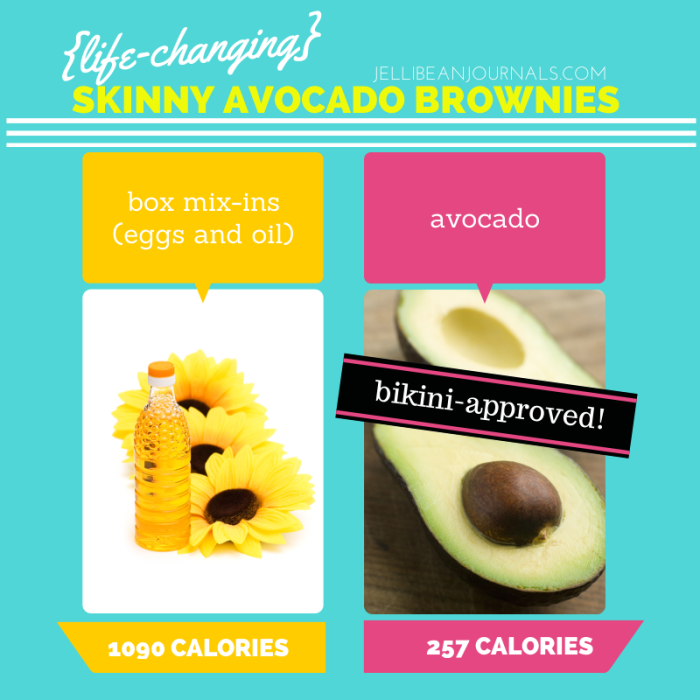 Let’s compare the calories of regular brownie mix add-ins (2 eggs and 1/2 c. oil) to using a fresh, wholesome avocado. This is the calorie count of the add-ins only, not the calories per brownie, which will vary depending on the mix you choose. The numbers speak for themselves. 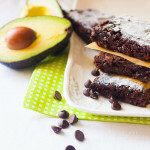 The best part is that even your toughest critic will never suspect there’s nutritious avocado stuffed into these deliciously indulgent chocolate brownies. I’ve successfully baked these brownies using the same measurements of avocado and water with both a 10.5oz. package of Betty Crocker fudge brownie mix and the KING of all boxed brownie mixes, a 20 oz. Ghirardelli triple chocolate brownie mix. Since I’m a chocoholic, naturally I recommend the Ghirardelli mix to stun your brownie connoisseurs. It’s just plain fabulous. Since I can’t just leave these skinny avocado brownies well enough alone, there are majorly droolworthy new spins on brownies coming your way soon. Be sure and sign up with my twice monthly newsletter so you don’t miss it! 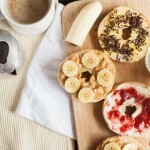 Follow me on Pinterest for more tasty treats delivered daily. 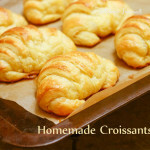 These look absolutely delicious Jelli! I love the substitute! Thanks, Jessica! Since we’re loaded with avocados year-round and they’re full of healthy fats, I figured I’d try it out. BOOM! Instant success that I just couldn’t help sharing. Thank you for visiting! Question: Do you also have tons of fresh produce year-round in Jamaica? I love this idea! I’ve seen recipes that use a box mix + applesauce, but a little healthy fat never hurt anyone. One question – is it tricky to get the avocado to incorporate into the dry powder? Did you have to blend up the avocado and water before mixing them in? Sarah, great question. Thanks for asking. I actually just mashed the avocado really well and dumped all 3 ingredients in a bowl. I stirred it up with a fork until combined, nothing special. If you want 100% assurance that the avocado is blended in well, I’m sure dumping it into a food processor or blender would also work. Hope you find time to add some brownies to your weekend! Thanks for stopping by. I’m making a batch with the avocado right now and the batter tastes delish, can’t wait to see and to taste the final product. I also stirred mine up with a fork. Great! So glad you like the batter. It surprised me, to be honest, because I think the batter tastes too much like avocado- almost to the point that I’d doubt the final product if I hadn’t made them before, haha. Hope they turned out fantastic, Erica! Over from the pinit party. These look great, and a way for me to actually get veg into the little one! Great idea, Andrea! I used to have this book that was all about cramming good-for-you produce into kid favorites. It’s a great read with tons of good recipes. You might want to check it out while the brownies are baking 🙂 Thank you for visiting. Thanks so much for pinning, Ashley! I got the idea from someone who’d made brownies by mixing in a can of black beans. I figured I’d rather use an even more wholesome mix-in and cheered like crazy when the first batch of brownies came out stunningly well first try. You’ve gotta try it! Thank you for visiting. Great, Jen! Like I said in the post, these are OUTRAGEOUS when you use a great mix with lots of chips. You really can’t go wrong with the Ghirardelli Triple Chocolate Brownie Mix. It’s incredible. Thank you so much for visiting. Yummy!! I am amazed these would work, but I totally trust you! They look amazing. How exciting! I am in need of a good, skinny chocolate fix! I was pretty surprised too! I’ve tried the shortcut “skinny” cake recipe that calls for a can of diet soda plus a cake mix and that turned out okay, but not magnificent. These brownies, if made with a great mix, turn out wonderfully. I cannot stress enough the importance of a stellar mix to begin with. Last night (and today) I was so disappointed by the lackluster chocolate flavor of the Betty Crocker mix. As avocado brownies they’re good, but because the mix isn’t super chocolatey and lacks chips it’s just nothing compared to the Ghirardelli. I think I’m hooked! Thank you for coming over, Joann. So glad you liked the recipe. I like avocados, but LOVE chocolate- especially dark. Hope you find time this weekend to bake a batch of “skinny” brownies. Yum! I love avocados and just used them in some waffles to help cut the other oils. A bit healthier right? Thanks for sharing this fabulous recipe via Tatertots and Jello link party. Using avocados in waffles? Now, that’s clever! My husband is waffle crazy. I’ll have to try that soon. Thanks for the tip. Hope you try this brownies and love them as much as we do! I cannot believe how easy it is to cut SO many calories! Wow, I have got to try this trick. The brownies look perfectly moist and chocolatey- I think my family would never know they were “healthy!” Thanks for the awesome tip! WHAAATT!! Life officially changed! This is awesome! I love me some avocado so I can’t wait to try these! YUM! Yum! and with only two…no three ingredients it’s too easy! You’re right, it IS too easy. Way too easy to find any and all excuses to make “skinny” brownies all too often. Yum. Thanks so much, Sami, for stopping by tonight. You really must try these chocolate superstars! 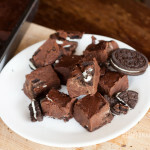 Definitely trying this with a dark chocolate brownie mix! Do you calorie comparisons include the brownie mix? 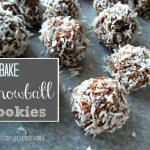 Kate, these would be splendid with a dark chocolate brownie mix. The calorie counts include only the add-ins, i.e. eggs and oil versus plain avocado. The numbers do not reflect the calories per brownie batch since every brownie mix differs. Thanks for stopping by! I see more and more recipes using avocados as a substitute. I’ve only tried avocados once (in chili) and it was very messy. Mmm. Avocados in chili sounds delish. We like to dice them and put them on top of tortilla soup, but I imagine that they’d be perfect for chili too. Thanks, Cassi, for stopping by today… and for offering me a great idea for dinnertime! Heather, the simplicity of this recipe is it’s best feature next to flavor. 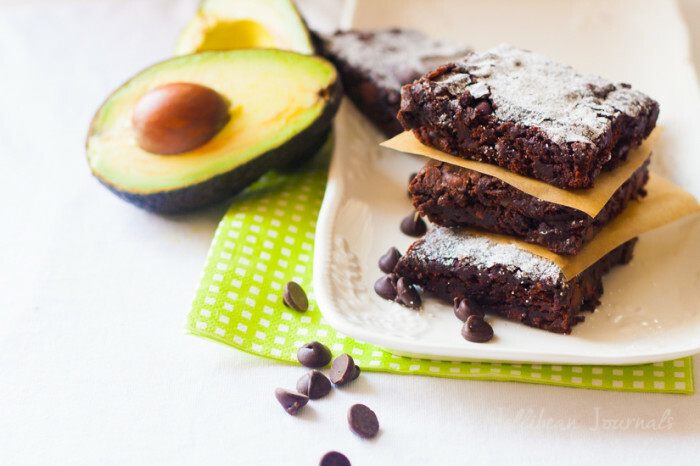 I’ve also seen tons of avocado brownies floating around online, but this quick-fix idea just really makes me happy. Hope you give them a whirl! Thanks for visiting. What about high Altitude? Flour? Great question, Ash. I bake at about 1 mile up. This recipe shouldn’t need any tweaking at all. Happy baking! Wow! I would have never thought to use avocado as a substitute but I am totally going to do this! 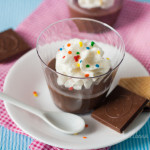 We make a chocolate avocado pudding all the time and my girls love it. I can see how this would work. Thanks so much for sharing! I’ll share too (Pinterest here I come)! I love making chocolate avocado pudding too, Jennifer! I stumbled upon that years ago in a teen mag. Was probably looking for Hanson info at the time, haha. 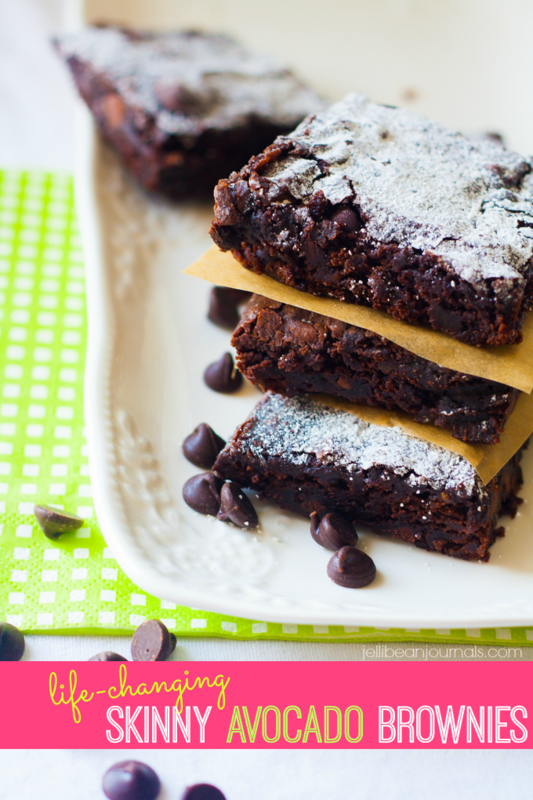 These brownies are really spectacular when made with a top-notch chip-studded brownie mix. Give it a try and let me know how they turn out! Only thing,the texture was more of a cake and not brownie like for mine…..Did I miss something?? Shweta, I’m so happy you loved the brownies! Thanks so much for stopping by to report on your victory. If you’d like them a wee bit more fudgy just take them out of the oven about 3 minutes earlier. Hope this helps. I wonder how well these would freeze? I don’t think my husband would eat them just because they’re healthy and he has a mental blockage of healthy foods ha! My son isn’t a big brownie/cake eater…. my mother-in-law would try them but not sure she would like them (I’m sure she would, she loves avocado). If it ends up being only me that eats them, I’d hate to waste an entire box (MFP calculated 208 calories per brownie using Duncan Hines Chewy Brownie mix so I couldn’t eat more than 1 at a time). If anyone has frozen some prior to baking, please let me know how they held up! Ooh! Adding Reese’s is right up my alley. Way to go and I’m so happy you loved them, Lyndsia! Wooooooohoooo! Just found this before I gave into my total craving! They are cooking as we speak…so excited about this! They smell amazing…Thanks for this! Yay, Drea! I can’t wait to hear how you liked them. They’re a big hit with all our friends and relatives. We’ll, ate a 1/3 of the pan!!! Eeek! 🙂 2 thumbs up!! Woohoo! Great to hear a positive review, Drea. Thank you so much for sharing your success with us. Enjoy the other 2/3 of the pan! Thank you so kindly !! Laika, you’re set and ready to go! Almost all brownie mixes ask for eggs, oil, and water, which the avocado and water will replace in this recipe. Sounds like you’re all ready to go. Hope you love it! Hello I’m trying on healthy and wanted to try these out. They look so yummy! Can I freeze them? Thanks for sharing all your healthy chocolate fix brownies. Hi Cher, I’ve never tried freezing them, but I imagine they’d freeze as well as any other brownie. We gobble them down so fast there’s no time to freeze. We just made these. At first it seemed like there wasn’t going to be enough moisture but it magically came together. We didn’t mash the avocado quite enough so it was a little off-putting but they turned out great. Rich and chewy, no avocado weirdness – just yummy. Took about 10 extra minutes to cook. I think maybe a muffin pan might work out better with time and less soft center. Good idea! Awesome, Ashley! Great tip for trying them in a muffin pan. Just be sure to grease it well. I’ve battled too many a brownie that wanted to stay IN the muffin tin rather than being scarfed down. Glad you liked the recipe. Happy baking! I’m wondering how this would work with a sugar-free brownie mix . . . I’m baking for a diabetic kid and I really want them to be good! Thanks so much! Janet, it’s worth a try. I’ve never done it before.